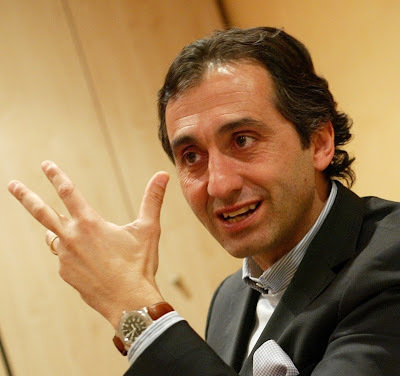 FC Barcelona Blog: Barça Transfer Zone: Estiarte: "Pep cannot say that he's the best"
Barcelona head of external relations and close friend of Barcelona manager Josep Guardiola gave an interview to Catlan sports paper El Mundo Deportivo. Some excerpts. Tell the truth. Did you and Pep ever think about winning the treble before you started? What did Pep thought when he took over the team? Before I joined Barcelona, he spoke highly about this Barca. And sometimes, at dinner and after drinking a glass of wine, he jokingly he said that he sensed something. And that feeling grew as time went by. In Rome , when the celebrations were almost finished, the giant screen captured you at the time that you embraced, exited, like brothers. What did Pep say to you at that moment? It remembered me of the Copa del Rey in Mestalla. There he said to me "We're rolling Manel". Well, he said "We rolled". That is his phrase, that is so him, he repeats it often when we win, it's his way to express his happiness, like when we won 2-6 in Madrid. The thing is that there in Mestalla he exclaimed it with deep joy, watching so many people happy, celebrating the first title. How did he experience it? Because it seems as if he internalizes things. Pep is aware of things, he often says when nobody is around that he is so lucky to be able to live this. Even in Rome, in a moment of maximum joy, with thousands of people cheering he never, I repeat to make it very clear, never something like "Oh, I'm so good", not even something like "How good we are!". No, he expresses things differently, he says "This is beautiful, how lucky we are, let's enjoy the moment". Always with modesty. It is not a show, because at those moments you are yourself, you can not hide your feelings or reactions. Although of course nobody could blame him if he would say "I'm the best", he cannot do it. What is clear is that he seems quite sure about what he is doing. Sometimes he comments how he will approach a particular issue and he says to me "Manel, I see it like this". I remember Soria, after losing the first league game against Numancia, he was silent for two hours on the bus. When he finally opened his mouth it was to say that he was not going to change anything, that he would continue with his ideas. If he strongly believes in something he will go all the way. But there will be moments of doubt. Well, he always tries to reason a lot. And before deciding, even though it seems that he gets carried away by instinct, he's thinking about things. Sometimes you're talking to him and you see that he is not listening because suddenly he is pondering something in all his aspects. If Pep is sanctioned, he asks you to sit besides him in the stands. Why does he prefer to have you near at that moment? He asks. As in the field of Bayern. He tells me to fix it with protocol to be together. Why? Well, he talks to me about football. And talks. I guess it's a confidence problem. There I felt that my presence helped him, especially before the game. UEFA forced him to be there an hour and a half earlier. Lonely moments, without being able to go to the dressing room, which was close. The nerves ate him and I tried to distract him until the game started, then he relaxed. It was the longest half hour of my life. How are you with the players? The "capi", Puyol, asked me to sit with him at Stamford Bridge too. And he said what would happen! Incredible! When Essien scored, his comment was "Manel, don't suffer, we will score when they won't be able to react". His words comforted me, yes, but the minutes kept going. When there were only 10 minutes left, he repeated that I should not worry. After 90 minutes, I didn't say anything and in the 92nd minute when Iniesta scored he shouted "I told you! I told you!". These are unrepeatable moments, Andrés ran down the sideline and I embracing the captain who even gave me kisses. What is the goal now? The same. We have something that we didn't have a year ago, the certainty of knowing that this Barça is a great team individually and collectively. The team knows it. That's positive. Half of the work is done, the quality football is there now. There is quality, there is work, there is security and confidence. He seems like a good person, although I don't exactly remember him. Man, Pep is such a smart guy. He said "We will score when they won't be able to react." and that's exactly what happened. Because it was so late in the game, they didn't have time to reply. Pep is something special. BarcaFan, it was Puyol who said that.. Pep is still special though. really nice. and i doubt pep will ever call himself the best, unlike a certain senor mourinho. This was the guy, in one of the stories published earlier, whom PeP spoke of that he wanted to see his role withing FCB to be enhanced. It was the story stating PeP's demands (More control of transfers and more control of the Cantera). Basically PeP's best friend. Oh, okay. I remember that post. Ok then Pep. If you won't say it then i will. Pep you're the best! BarcaGirl we have a girl now on board ? Thanks for translating, I'm a big fan of mr. Estiarte!